Just had a short conversation on collecting USFA guns. The big concern was the paper work and box the gun had with it or was in. With these guns pushing $2500+ and clearly a step ahead IMO of any SAA built to date including the newest "Standard" I find it had to believe anyone is actually willing to pay $2500 for a handgun, when they don't actually know what makes the late model USFA guns the REAL Standard for a SAA. It aint the paper work that is for sure since damn near every thing USFA and USPFA before them published was pure fabrication. But here ya go...what I was told "serious collectors" look for, "the Indian" from the Denver Public Library Like always…, my advice is "buy the gun not the story". Re: Are you kidding me?! If Standard is able to stay the course, I'd imagine USFA's will drop in price. What, in your experience with the new Standard revolvers, makes them of lower quality than a USFA? I've owned a few USFA's myself and agree the quality is very, very high, but by no means unable duplicated, or perhaps even bettered since there are on cast parts in the Standard. I 'd have to say Standard needs to get in line and produce something better than 3rd Gen Colt or the last USA made USFAs. Not been done so far past the speculation. If they produce a better gun it is still just a "pre war" model, no other calibers besides .45 (not even a 45 acp yet) and no BP frames. Going to be awhile before you see the premium USFA guns drop in price IMO. In fact because there will be no more of them and they are already well known premium quality SAA I'd bet they go up in price not down. None besides an educated look at the photos and the obvious Uberti/USFA specs they have admitted to and are using to built their own version. I did ask Standard and got answers to some very specific build questions. I've owned a few USFA's myself and agree the quality is very, very high, but by no means unable duplicated, or perhaps even bettered since there are on cast parts in the Standard. No one has built a better (tighter tolerances) SAA that USFA but Freedom Arms that I am aware of. Although not surprisingly Uberti was getting there with current production until they switched to the new the hammer/safety. Colt sure hasn't in over 50 some years if then. And Colt now uses a number of cast parts. So far just by the options and roll marks Standard hasn't upped the game any IMO. I just took a USFA gun apart while typing this and don't see any cast parts. Newest third Gen Colt cast parts? Start with the trigger guard. "Buy the gun not the story". True with any Colt, true with any USFA and certainly true with a new gun that has yet to prove itself. But here ya go...what I was told "serious collectors" look for, "the Indian" from the Denver Public Library Like alwaysâ€¦, my advice is "buy the gun not the story". who really have no interest in firearms at all, but are simply considering them another "investment". These seem to be the same folks who buy high-end "anything" for profitable resale, not for use. Gold, Bitcoin, Cars, houses, wives whatever. Now they have turned their sights on "collectible firearms". If I ever manage to snag a USFA , it will most likely be a Rodeo and I will follow in your footsteps to refinish it, then shoot the he77 out of it! Wow, it is hard to believe anyone would honestly consider the paperwork and box the determining factor over the actual firearm in the box. Seriously! Personally, if I were looking to purchase a quality shooting single action army type revolver I believe I would find and buy a 100% USA made USFA Rodeo over most if not all of what is currently available. The only difference between them and the Premium USFA is CC and bluing. Yes, that original CC and bluing look is nice and adds to the overall value but I donâ€™t think it affects the guns smoothness of operation and accuracy since they were both built with the same quality in mind. I hope the Standard Manufacturing SAAâ€™s are of exceptional quality as I would like to see someone else pursue the standards set by the later produced USFAâ€™s. I certainly donâ€™t think Colt will. Agreed. This one started out as a Rodeo. But when I found it capable of one hole groups at 25 Yards and able to cut three playing cards in three shots I thought it something special. While I still own a few premium USFA guns, haven't shot one since. These are the Rodeos I shoot now when ever I get the chance. LOL - I sure ain't no collector! If I could talk myself into spending the money for the USA made USFA BP frame 45 Colt in the first picture, the first thing I would do after taking the it out of the box (which along with the paper work would get tossed up on a shelf) would be to shoot it, with black powder. Guns weren't made to be collectibles, they were made to shoot. Aint that the truth. I might collect a few guns but I surely don't collect worthless paper and boxes. How may times you heard the story of empty gun boxes, extra grips or parts and loose ammo at a yard sale but not a gun in the house? Takes all kinds as we know. Just not my interests. I just want mine to be made well and shoot even better. Those are the guns I collect. How may times you heard the story of empty gun boxes, extra grips or parts and loose ammo at a yard sale but not a gun in the house? Takes all kinds as we know. Just not my interests. I just want mine to be made well and shoot even better. Those are the guns I collect. We saw all this last century with winchester commemoratives - early on blokes bought em with only the money in mind - "Limited Edition" collectables - new in the box - unfired - blah blah - fifteen years later they started coming out of the woodwork and for a while you could buy a nice one for cheaper than a new AE 30/30 - I bought a O F Winchester cheap kept it a year unfired - walked in my gunroom one day and that thing was sneering down at me from its perch - grabbed it and a few shells and out we went - three touching at fifty yards - holy smokes !!! The next weekend I got serious with it and shot a couple nice ten shot groups using a plastic fertiliser bag half full of dirt for a rest on the roof of my old subaru - would you believe - that plastic bag took the gold plating off right along the underside of the action (only the sharp edges) so ruined it as a NIB collector for ever - now I had me a real nice shooter - I lucked onto a stash of once fired brass cheap at a shoot - got me a mold off Mr LEE - had a set of dies already - one more nice gun on the rack ready to go to work. Still have not figured out how I managed to leave that one on the rack for a year unfired - take it down - talk to it - oil it - put it back - boring!!!!!!!!! I would agree...a gun is tool , a tool is meant to be used , that it's lot, to exist and to be used. I also have , several pre-1900 collectibles which I do shoot...1891 Winchester , S&W Russian ,Krag to name a few. or selling to the collectors . It has always struck me that the original SAA was a mass produced military sidearm built to a price. Like the 1911, it was meant to be a little loose, a little rattily, and able to kill a horse at close range if needed. Not sure where you got the loose and rattily idea but it is wrong on both counts. Not the SAA and not the 1911. The original Pre WWI Colt 1911s were some finely finished, tight and accurate guns. Fit by hand by guys that knew what they were doing. They weren't worn out, several times rebuilt, from surplus parts, 1st WW guns they reissued in Korea or RVN decades later. Find an original early Colt 1911 and take a look. Those early 1911, military and commercial guns both, put the current "custom shop" Colt production to shame in every way. The Colt SAA? Orginal guns were, again, build by craftsmen who cared about what they were making. Take a look at any of the early 1st Gen guns that were issued and unused or any of the early civilan models. Some dang nice guns, rock solid lock up and shot to point of aim with the right ammo. Colt has never equaled them. USFA came close in some ways but not others. There was a reason the early Colt revolvers were so treasured and respected. It is because they were actually finely crafted tools. And they shot like they were just that, a finely crafted tool. Have to agree with Yahoody! The build tolerances the Colt factory used says anything but "sloppy". They learned in the " open top" era that "loose" doesn't get better, it gets worse. Attention to fit and hardening parts that should be but aren't can give a "run of the mill" Italian offering (open top or top strap version) an incredible change in its mechanical accuracy and it's disposition!! Drydock and Yahoody are both right in a way. The SAA was originally designed (intended) as a service weapon, not a match or target handgun. As such it wasn't meant to shot little tiny groups, but it was required to hit a man sized target at some distance and to put a horse down. I think these requirements were both within 100 yards. At the same time the SAA wasn't "loose" or "rattling" when newly issued. They were as finely crafted as any of the brand new cap and ball Colt revolvers. Colt was looking for market share everywhere. You don't get that with a poorly fitted gun but rather one that would impress potential buyers. As such it wasn't meant to shot little tiny groups, but it was required to hit a man sized target at some distance and to put a horse down. I think these requirements were both within 100 yards. Nothing wrong with a gun that will do both...big caliber and lot of energy in the old black powder 45 Colt ammo and a delivery system from Colt that was fully capable of fine accuracy...like hitting a man at 100 yards with a gun typically shot with one hand back in the day. Original guns out there still capable of doing both. This one is a youngster and nothing special, shipped July 1900, and still has the original barrel. Just past 118 years old today. Hitting a 1/2 size steel IPSC target at 100 yards is no chore with 230 smokeless loads. Everything on this gun, which is proffed for smokeless, is still within US Army specs. except the barrel length. Same gun is very capable shooting excellent groups off hand at 15 yards poa/poi. No, I think not. I've handled GI issue weapons of all types, including museum kept unissued GI SAAs, and 1911s, not to mention NA&Ns and 1909s. They all have just a touch of looseness to them. Just a touch, a touch of rotation when locked up, a bit of endshake. This does not affect their reliability, or general accuracy, but does make them easier to manufacture in numbers. I've also handled beautiful presentation pieces, gifts, custom guns, private purchase sidearms, that do indeed put a watch manufacture to shame, but not something issued to a Grunt. These also tend to be the best preserved firearms, and may skew what we think of as 19th/early 20 century hand fitting. Don't confuse this with the rattle of a shot out 50 year old 1911 at the end of its service life, that's not what I mean. I just think some folks have this unrealistic expectation of tolerances in what were general issue weapons. .A man once handed me a beautiful Canadian issue 1911 made in 1916. Barely had any blue worn off the slide rails. With just a touch of lateral play. Hold it close to your ear and shake it hard, and you could just barely hear it. As intended. This was steam engine technology after all. All slide actuated handguns have their basis in the single bar Locomotive Crosshead. They certainly could do it. But for most guns they did not have to. Every one gets an opinion based on their own experiences and prejudices. These also tend to be the best preserved firearms, and may skew what we think of as 19th/early 20 century hand fitting. Always a spectrum of what was done "hand fitting" then and now. I'll take the best. You are welcome to the rest. I'm no expert but I believe the tolerances to which military SAA's must adhere are described in Kuhnhausen's SAA Shop Manual. Just for the heck of it, I just checked 3 new in the box cartridge S.A.'s (a R.M. conversion in 38spl, '72 Open Top in 45C, and '58 Remington in 38spl . All Uberti products). The Remington had no perceived endshake. None had any rattle. The "arbor" guns haven't been corrected yet but will end up with .0015"- .002" of endshake. Maybe Uberti does a better build than a lot of folks want to give them credit for?! Helps to remember that the original Colt 1873 was made to shoot BP...and lots of it without cleaning. Given to a typical trooper likely meant even less cleaning. That and the documented "camp swaps" where guns were cleaned as a group and reassembled without the original parts. So no question there was some "flex" in the original guns. I sure would not call them loose. If they were loose you couldn't swap parts and still have functioning guns. A high quality SAA doesn't work that way. Uberti? Very little hand fitting done today. Thank goodness! You can drop in a new cylinder or hammer and have as "perfect" a gun as when you started. That is a good thing. Pretty amazing actually. You can't do that with a current Colt. Current Uberti and Colt? I have both and I'd give the nod to Uberti as being a better quality firarm...by a lot. The Uberti costing between 20 and 25% of the current Colts makes it a one sided argument to me. What ever the Uberti looses in cosmetics it makes up for in their ability to shoot POA/POI. Competition between handguns brands begins and ends with, "do they shoot!" for me. Funny you should mention that.... 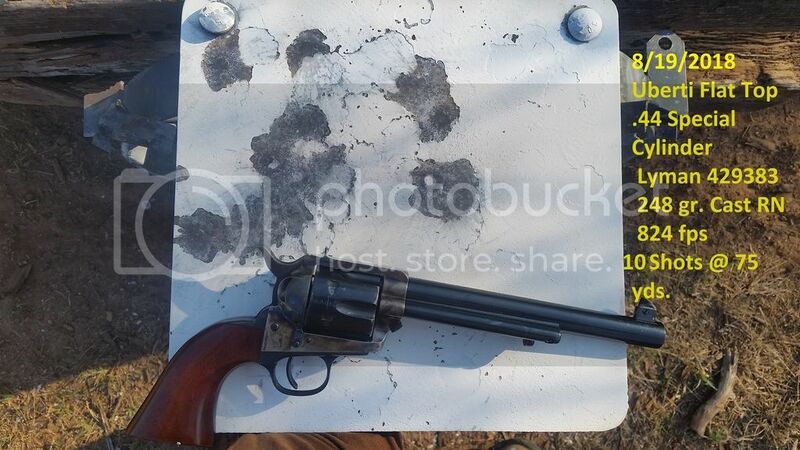 I just took possession of a current production (Date code CT) Uberti Flat Top from Dixie Gun Works. It's a 44-40, but I have no interest in that cartridge for a handgun, and intend to order a .44 Special cylinder in a couple of weeks. So to satisfy my primal urge to shoot, I just took the cylinder out of my 2011 production Cimarron Model P, dropped it into the Flat Top and headed out behind the shop with a few dozen rounds of handloads. I was astounded by the accuracy of this revolver...it ties with my USFA as the most accurate revolver I've ever owned, but the target sights and the wide trigger make it much, much easier to shoot. You didn't. I know you have a few other Ubertis that shoot just as well (or almost) from prior posts. But you have stumbled on the USFA and now Standard's secret...very little or no hand fitting required on a updated Uberti CNC program. For the chit you were giving me the Colt forum good to see you are starting to get what is actually happening. 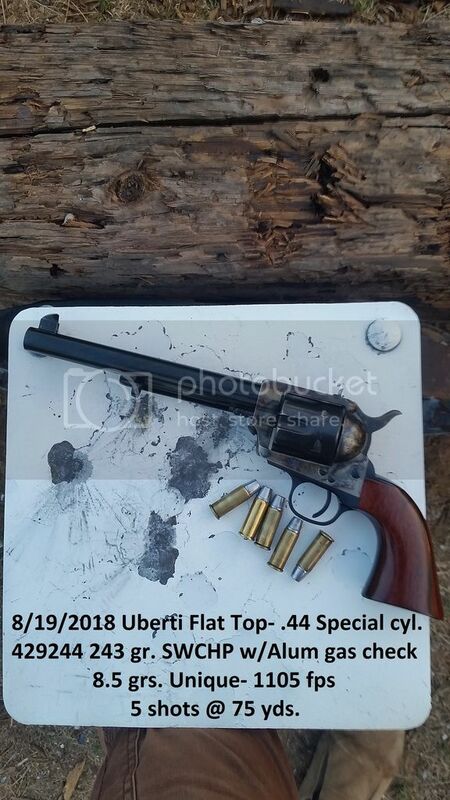 I too am using a 44 Special cylinder in my Flat Top and that 44-40 cylinder in a 4 3/4" BP frame gun that the 44 Special cylinder came out of. The cylinder gap on the BP .44wcf Swap gun is now .0015" and the things shoots like a laser with 200 gr bullets and Unique. The 4 3/4" is so good as a 44wcf that I lost interest in the Flat Top. I've been aware of the non-need of hand fitting for a long time, that's why I own so many Uberti's. However I have a deep appreciation for craftsmanship and have for years wanted a superbly built, beautiful SA revolver. Before USFA went out, I spent much time on their site planning my eventual purchase. That is why I'm so thrilled that Standard is dipping their toe in the water. I was giving you scbidt because of a the nitpicking posts about the Standard's being too much of this or not enough of that. Just be glad there's someone giving the SA business a go!